by Tyler Berryman and Robotiq Inc.
You may be reloading this page trying to figure out if the title of this blog post got mixed up with something else. No, you read it correctly, I am going to outline similarities between Industry 4.0 and Pokémon Go. First off, if you aren’t familiar with the term Industry 4.0, or if you weren’t born after 1990 and you don’t know what a Pokémon is, fear not: a crash course in both subjects is coming up. Industry 4.0 is a term coined by the Germans in 2011. It is not a new technology, and it is not a new industry. It is a new approach to achieve results using technological advancements from the past 10 years. One key aspect of this industrial revolution is the Internet of Things (IoT) and the multitude of cyber-physical devices that have the ability to collect data that can be used by manufacturing companies. Great strides have been made in the world of big data and analytics, allowing systems to sift through heaps of information in the blink of an eye and provide useful insight for manufacturing, marketing and decision making. Behind the term Industry 4.0 comes the dream of the smart factory. This is a factory that uses robots to automate production, sensors to feed the optimization effort and even artificial intelligence to perform complex tasks when most of the workers are still on summer vacation. The factory will also use big data analytics to predict the next trend in product design or manufacturing, thus enabling a more targeted production or marketing strategy. The Internet of Things provides a means for machines, robots, sensors and humans to communicate regardless of their geographical location. This information transparency also allows smart factories to create virtual copies of their factories, allowing to input sensor data to simulations of production runs. The advancements in the modern factory could add $14.2 trillion to the world economy over the next 15 years according to a report released by Accenture in January 2015. Pokémon Go is a mobile location-based augmented reality game developed by Ninendo. Pokémon is a worldwide phenomenon that dates back to 1996. In the game, users are encouraged to venture outdoors (in the real world) to capture, battle and train virtual Pokémon who appear in the real world through your mobile device. The player’s avatar moves through a virtual map and runs into different Pokémon based on the environment . Near lakes and ponds, water-type Pokémon can be spotted, whereas in the downtown areas, the Pokémon resemble rats and pigeons. The game uses the mobile device’s GPS to position the user’s avatar on the virtual map and the device’s camera to provide a real world background on the device’s screen. As the player walks around looking at the world through his or her smartphone, Pokémons that pop-up on the screen and users can throw a Poké-Ball to catch it using the device’s touchscreen. Since the release of the mobile game one week ago, Pokémon Go has become the most played mobile game in history. Furthermore, the average daily use of the app on Android devices exceeds the use of Snapchat, Instagram, Twitter and Facebook. According to SimilarWeb, 5.92% of the android devices in the United States are engaging with the app on a daily basis. This popular launch has had a very positive impact on Nintendo’s stock value, that is, if you consider an value increase of $9 billion a decent days’ work. Now that you are up to speed on the basics of the Industry 4.0 and the world of Pokémon, we can get down to the analytics. First of all, it is obvious that both make the most of the data provided to them by their sensors. While Industry 4.0 uses data from robots to provide inputs to their cloud computing algorithms, Pokémon Go uses data provided by a mobile device’s camera, GPS and gyroscope to provide an augmented reality experience. Second, both innovations are based on a machine-human interaction. 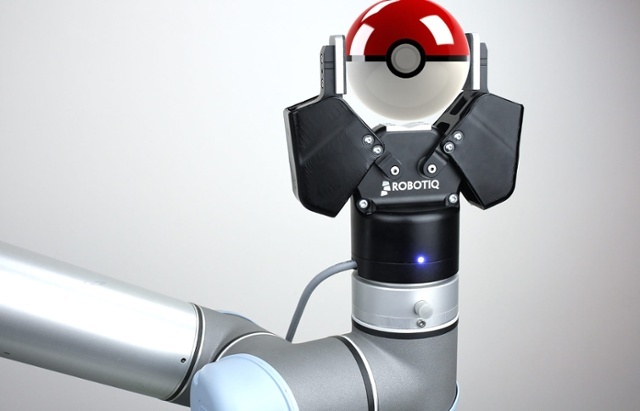 Industry 4.0 allows collaborative robots to interact in a safe environment with humans, and Pokémon Go creates an augmented reality relationship between a human and a mobile device. The key to success for these innovations is the learning curve required to get up and running. In the case of collaborative robots, the user can program a pick & place program using a UR robot in a few minutes. Upon downloading the Pokémon Go application, the user can be out in the real world catching Pokémon and battling in gyms in the time it takes to tie your shoes. This is essential for strong adoption rates. Compare Pokémon Go to modern video games that can take hours to learn. The same can be said about the time and effort required to learn how to program and integrate traditional industrial robots. Finally, an important aspect of both Industry 4.0 and Pokémon Go is its adaptability to the end user. In Pokémon Go, the user decides whether to play from the comfort of his neighborhood or to take marathon length walks in search of the rarest Pokémon. The same can be said for collaborative robots: the smart factory can use many different robots and an even wider variety of end-effectors, such as suction cups, grippers, magnetic gripper, etc. You can also decide to build the network, by implementing cloud computing, big data analytics, or to keep it simple and with a single robot to help free your workers hands from dangerous or monotonous tasks. In both cases, people are getting out of their comfort zones. Gamers are, literally, getting mobile and playing outside the home; while production floor workers go from simply feeding parts into a machine to managing their new robot colleague. Think about this: the next time you see a man standing in the middle of the sidewalk, he could be catching the rarest of Pokémon, but he could also be checking in on his factory’s robots – all from his smartphone.